INTRODUCTION : Open appendectomy is the most common and most popular operation in Pakistan. There are few studies from the third world countries to compare the Open appendectomy (OA) with Laparoscopic appendectomy (LA).The aim of study was to compare the postoperative outcome of LA with OA in terms of operating time , hospital stay , postoperative morbidity and time to return to normal activity. 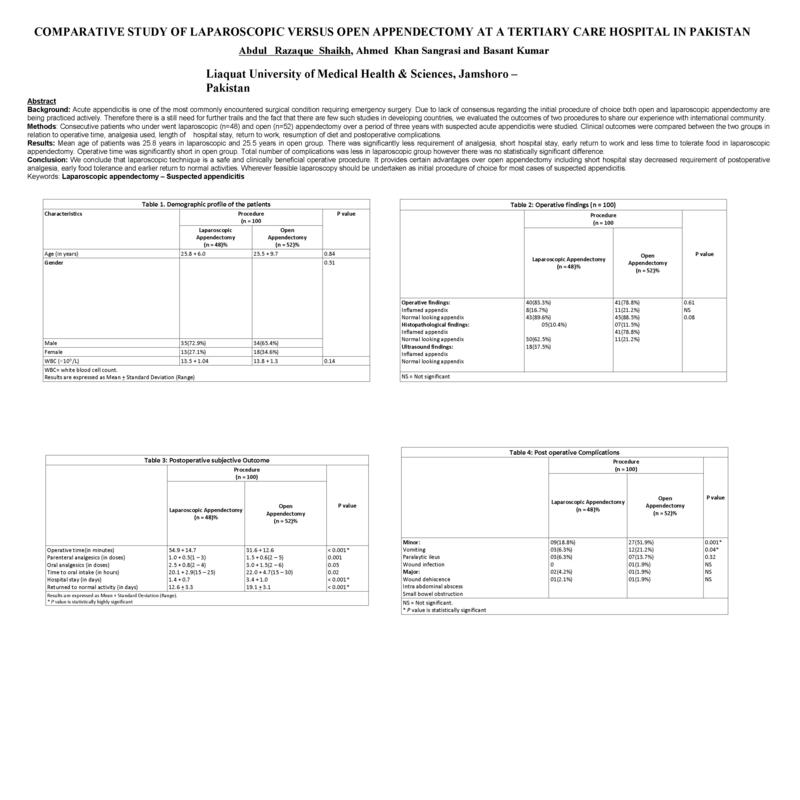 METHODS AND PROCEDURES : This prospective comparative study was carried out at surgical department of Liaquat Universty of Medical Health & sciences Jamshoro Pakistan from January 2006 to Decmber 2007 . There were 100 case of clinically diagnosed acute appendicitis between the age of 15-45 years .Patients with mass right iliac fossa and female with history of amenorrhoea were not include in the study. All the cases were randomly allocated two groups., 50 in OA and 50 in LA.